Mash one strawberry and mix with sour cream. Apply the mixture on your face and neck then after 30 minutes remove it with fresh water. 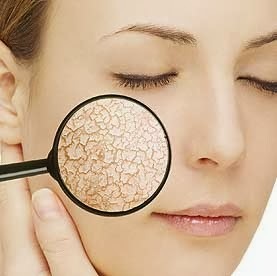 This is one of the best remedy to cure dry skin at home. Prepare a fine mixture by adding 1 egg yolk, 1 teaspoon of orange juice,1 teaspoon of olive oil, few drops of rose water and some drops of lime juice. Mix them well then apply this prepared mixture on the face and neck. After 15 minutes rinse off with fresh water. Mix 1/2 teaspoon honey with the yolk of an egg and one tablespoon dried out milk powder. Mix into a paste and apply on your face and neck.after 15 minutes wash with water. Mash a ripe banana and apply it on the face and neck. Leave it for sometime and then wash the face and neck with lukewarm water. Take two bananas, one tablespoon of honey and half a cup of yogurt. Put all ingredients in a blender and mix until becomes homogeneous.Apply the mixture on the skin and wait for 20 minutes, until it dries. Remove it with lukewarm water.This is one of the best face masks to cure dry skin. Mash half an avocado and mix it with a few drops of fresh lime juice and apply this paste over the cleansed skin. After 15 to 20 minutes wash your face with clean water. Apply the juice from cucumbers on your face with a cotton swab for 20 minutes.Cucumber juice is great for moisturizing and softening the skin. If the skin is too dry, add one tablespoon of almond oil at 250 ml cucumber juice, shake well then apply on skin and gently massage for few minutes . After this leave it for about 30 minutes and then wash with chamomile tea or plain water. Mix two tablespoons of honey with two teaspoons of milk. Apply the sticky mixture on your face, and leave on for 15 minutes. Then rinse off with lukewarm water. Take some lemon juice squeezed from one or two lemons and mixed with egg yolk and also add a teaspoon of honey. Apply this mixture on your skin for 15 minutes then rinse off with clean water. Try to eat foods rich in Vitamin A and C. Vitamin A regulates moisture manufacturing in the skin to prevent dryness. It also balances sebum production in the scalp to prevent dandruff and brittle hair growth. Rich sources of Vitamin A include broccoli spinach, turnip greens, carrots, squash, sweet potatoes, pumpkin, cantaloupe, apricots, liver, milk, butter, cheese, and whole eggs. Vitamin C encourages the skin to absorb moisturizers that have been applied on to the body.It also fights against damage from the sun and environmental pollutants that harm the skin. Vitamin C can be found in kiwis, papaya and citrus fruits, such as oranges, lemons and grapefruit.